RECORDED LIVE, IN TORONTO, WHILE ON TOUR WITH EVERCLEAR AND NO DOUBT. Where were you on Valentine's Day, 1996? If you're New York-based power-pop/rock outfit Ruth Ruth, you were in the middle of a tour, supporting your debut full-length, "Laughing Gallery" (Ventrue/American Recordings), playing a show at The Opera House. In Toronto. With Everclear and No Doubt. And, that is where this record was recorded. 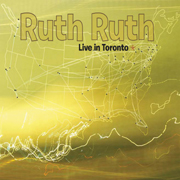 Originally recorded for the CBC, who was at the show recording all three bands' performances for live broadcast, "Live In Toronto" showcases the magic that was Ruth Ruth: biting lyrics, fierce guitars, a thunderous rhythm section, all played with energy, sweat, and a lot of youthful vigor. It's what made Ruth Ruth's "The Catcher in the Rye"-esque sound so powerful. Of the record, front man Chris Kennedy says in the liner notes: "It's been a little over a year now since the possibility of releasing a live Ruth Ruth album came up. I'm glad it's finally happening. This CD is my goodbye to the band and I wanted to go out with a bang. During mixing, hearing the songs over and over, I let myself relive all the memories. What makes me smile when I'm listening in the car are all the imperfections, flat vocals, wrong chords, fast tempos, stupid lyrics. It was fun. I loved playing in a band. We were pretty good. Bang." And, so it goes. After MTV exposure, tours with Space Hog, Sponge, Everclear, No Doubt, and countless other bands, records on Ventrue/American, Epitaph, and RCA, Ruth Ruth's legacy comes down to a live record, recorded at the height of their career. If you missed their live shows (and, believe me, if you never saw them live, you missed out), then here is your chance to witness aurally what made Ruth Ruth such a great band. BANG, indeed.